Great writing is indispensable for all of social science, but especially so for Contexts. This issue features examples like Evelyn Bush’s careful reading of a controversial new book on the Crusades, Robyn Autry’s intriguing account of a South African apartheid museum, and a collection of pieces on hooking up, sleeping over, and straight girls kissing. To recognize some of the finest writing under our editorship, we’re giving out “Claude” awards—named for our founding editor Claude Fischer—at our August editorial board meeting. As another tribute to excellent writing, we want to recognize an often-overlooked quality shared by these Contexts authors, and perhaps all writers, really: the art of being edited. Being edited is about much more than having someone proofread your syntax, citations, and spelling. It’s also about more than fact-checking or ensuring that the scholarship is correct. Being edited, at least at Contexts, is about working together so that phrases, formulations, and word choices are not just correct, but concise and engaging. It’s about coming up with a frame that draws readers in, a narrative that carries them forward, and a conclusion that’s both satisfying and thought-provoking. In our experience, even true pros rarely bring us clean copy and clear prose on their first try (though there are a few such exceptions, bless their souls, fingers, and pens). Instead, the best authors are those who are willing and eager to get suggestions, hear comments and criticisms, rethink their arguments and formulations. None of this comes easily after so much time and energy has been spent puzzling through, outlining, crafting, and delivering that first full draft. After all that, many of us authors are so exhausted we’re just ready to be done. Certainly that’s what the standard journal publication and review process tends to teach and reward. Yet once we get a piece through the scholarly process at Contexts, our editorial work has just begun. There is, ultimately, a sociological point here too. As isolated and isolating as the task of writing may sometimes appear, crafting an excellent article is a social process—a concerted, collective activity. having been through the process twice now with the editorial team, let me say that "being edited" by these people is a privilege and a joy. that they enjoy good writing and put a premium on writing is so incredibly pleasing, and illuminates such an unfortunate contrast to other journals in our field that show little to no interest whatsoever in the art. 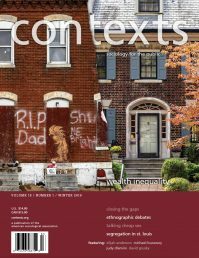 if only other journals did anything even mildly resembling what contexts does, the public might pay more attention to our collective sociological efforts.